Admission to the United Court of the Pikes Peak Region’s Winter Cotillion Event. Club Q, 3430 North Academy, Saturday, March 10, 2018 at 5:00 pm door, 6:00 pm event. UCPPE Member pricing of $12.00. Tickets are to be picked up at the door. Festivities include the Prince and Princess of Snow Competition, the disbursement of funds from Reign 41 and special command performances. 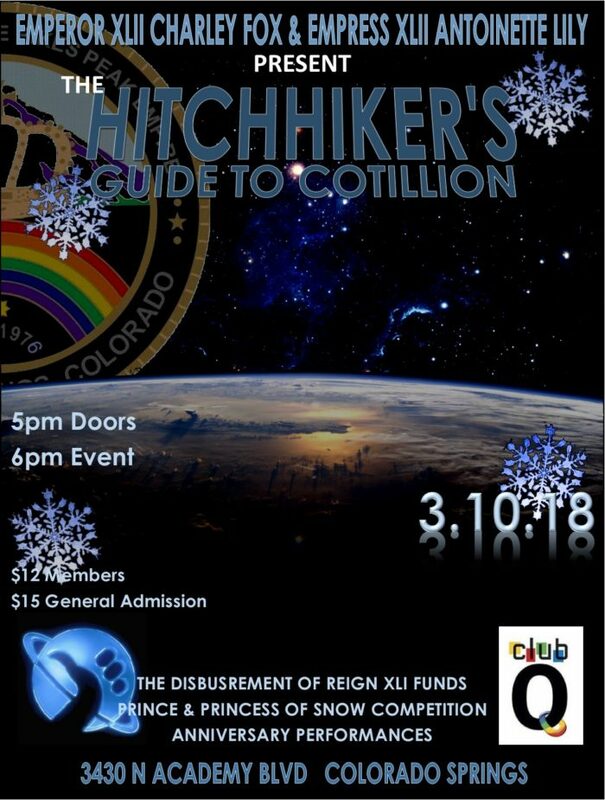 Admission to the United Court of the Pikes Peak Region’s Winter Cotillion Event. Club Q, 3430 North Academy, Saturday, March 10, 2018 at 5:00 pm door, 6:00 pm event. UCPPE Member pricing of $12.00 (suggested donation). Tickets are to be picked up at the door. Super excited about this event, can’t wait to see the charities that last year’s reign have donated to. Also interested in who’s running for Prince and Princess of Snow competition. Best wishes to all contestants!